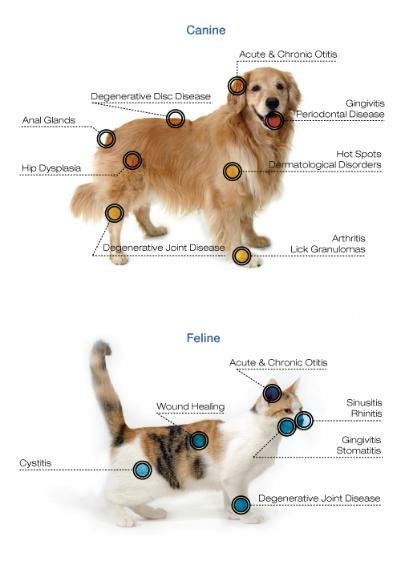 Companion Therapy Laser is an advanced pet care technology that effectively treats a wide variety of conditions from arthritis to wound care without the use of pharmaceuticals. Our laser therapy uses light with a specific wavelength to create a therapeutic effect. The applied light stimulates the functioning of the injured tissue and cells. When enough light reaches the target body tissue, it promotes a chain of chemical reactions in a process known as photobiostimulation which in turn results in a decrease in pain and inflammation and accelerates the rate of healing. 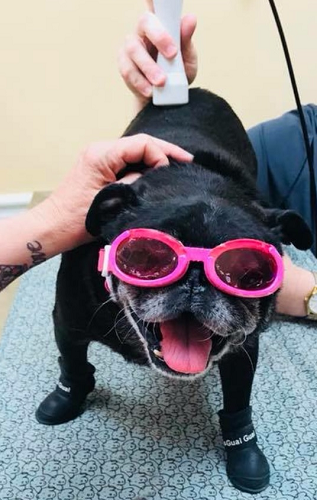 Why Treat Your Pet with Laser Therapy? Laser Therapy allows your pet to heal faster after surgery and any traumatic injury. Different conditions have different signs. Any pet discomfort is worth being treated. Some common signs that your pet is experiencing pain and discomfort include trembling, lack of appetite, limping, not wagging the tail, restlessness, abnormal lying or sitting posture and whining. What Conditions Does Companion Therapy Treat?